Plumbing the depths of Hi-Rez's latest lane-pusher. 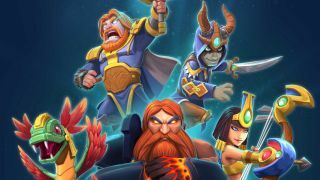 Smite Rivals looks quite a lot like mobile hit Clash Royale. That comparison is impossible to avoid, even if you're familiar with competitive tower defense in other contexts. Two players spend resources from a regenerating pool to deploy minions and spells onto the battlefield, which is divided into lanes linking opposing bases. Minions move down the lanes and fight one another, with sharp thinking and good strategic timing winning you an advantage that can be translated into damage to your opponent's buildings. Destroying buildings nets you points, and after each match's short timer is up the winner is the player who did the most damage. Rivals differentiates itself in the details, and the more I played the more significant they seemed. Each battlefield has three lanes, rather than two, which naturally increases the skill ceiling of the game. Maps are also larger, at least to my eye, with more substantial travel time required to get from point A to point B. And while both games allow you to assemble a hand of eight cards from your total collection, in Smite Rivals one of those cards must be a god from the MOBA's wide pantheon. These gods have two roles. In the first case, they're powerful elite units with distinct strengths. The archer Neith has substantial range, acting as a map-wide threat even when deployed behind friendly lines. Thor can be deployed anywhere in the map, landing with a crash wherever you direct him—a handy counter to a backline-hugging Neith, as it happens. Gods also have special powers that cost a small amount of mana and can be triggered on a cooldown. Thor can boost his mana regeneration for a limited period of time, Neith can grant temporary invulnerability to structures, Khepri reduces the cost of cards in his hand—that kind of thing. There's laudable depth, here, that speaks to a willingness to take the tower defense formula apart and tinker with it. The resulting strategic back-and-forth is part tug of war, part rock-paper-scissors. Recognising the threat posed by different parts of your opponent's hand and deploying an appropriate counter is the heart of the challenge, gods complicating this in an entertaining way. I experimented with a deck packed with low-cost minions, for example, to see if I could overwhelm my opponent and end the game quickly. Against Egyptian beetle god Khepri, however, I had to rethink my strategy. His frontline durability provided my opponent with a solid defensive foundation that reliably rebuffed my hordes. I had to play around Khepri's high mana cost, hope to gain an advantage in the gaps between deployments, and cross my fingers. I lost. There's a lot to learn, and a lot of counters and strategies to internalise. The pre-alpha version I played has five gods available with plenty more greyed out, coming in the future. Eight cards in a deck isn't very many if you're used to a traditional card battler, but rock-paper-scissors only has three units—this has eight at a time, out of a total pool of dozens. There's fun to be had figuring that out. The version I played was running on an iPad, so I haven't yet seen how the controls (or the vertical aspect ratio) will translate. That said, it's extremely straightforward. I can't imagine that dragging minions from a hand of cards to a battlefield will be very much different with a mouse. Aside from the simple fact that it'll be available on PC and Clash Royale isn't, these early matches suggest to me that there's enough to differentiate Smite Rivals from Supercell's game. Hi-Rez also has a track record of offering straightforward bundle deals that functionally allow you to 'opt out' of the free to play grind for the price of a regular game: I'd love it if they offered that in this case, as microtransactions cast a shadow over this genre. Yet there are also points of comparison that make me cringe, where I feel that Hi-Rez could have done more to differentiate themselves. The art style is one. Rivals is certainly a departure for Smite, trading Unreal Engine grit for friendly cartoon polish. Yet the chibi-fication of Thor and pals has left them in territory that does feel uncomfortably close to their App Store-busting rival. They have the same square jaws and plasticine skin, the same proportions, the same expressions. As such it's understandable to be cynical at first, even though Rivals sets itself apart when you take the time to dig into the details. Hi-Rez has had this issue before, with Paladins, and ultimately I don't think it's an issue if the games are well supported and enjoyable. Yet it's also an avoidable problem. It's much easier for audiences to approach with an open mind when games don't look quite so much like their obvious rivals.